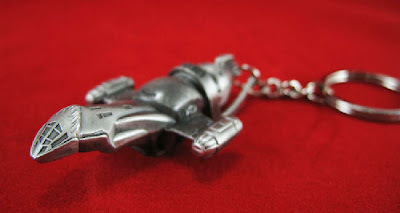 This has to be the coolest keychain ever. I want one right now. Unfortunately, I could only sign up for the mailing list. From the company's post: "We’ve been working on this one for over a year now. If making a big Firefly replica is challenging, then making a small one is no less so, as you try to decide what details to keep, what to reject, and how to take a ship that in “real life” is over 269 feet long and shrink it – convincingly – down to two inches. Cast is solid metal, the keychain has real heft to it. We used the studio CG effects files, shrunk down to a ridiculous extent, to capture the design, but obviously had to make many tweaks along the way. But our designers love a challenge, and we just couldn’t resist the idea of a Serenity that fits in your pocket and that you can carry around with you, where ever you go." Until then, I've got the theme song and the DVD series to keep me company.